Detention center among those used in Argentina's 1976-1983 "Dirty War"
Tens of thousands said to have been abducted, killed during "Dirty War"
BUENOS AIRES, Argentina (CNN) -- More than 10,000 charred bone fragments were found buried at the site of a former Argentine government detention center, the first find of its kind at one of the secret centers, Argentine officials said. Bones were unearthed during a seven-month search at an ex-detention post in La Plata, Argentina, officials said. Searchers said they also found a wall with more than 200 bullet holes and an "important quantity" of spent ammunition shells on the ground nearby. In some cases, bullets were still lodged in the wall. The announcement was made Tuesday at a news conference by government officials and representatives of the Argentine Forensic Anthropology Team, better known as EAAF, the initials of its name in Spanish. A team of six professional anthropologists and support crew said it believed the remains were human, but it was unable to determine how many bodies the fragments represented. "I ask the forgiveness of family members, because I can imagine what the mothers and all who are gathered here will feel, but what we are about to show is not to detail the genocide but so that we have proof for the trials that are to come," said Sara Derotier de Cobacho, secretary of human rights for Buenos Aires province. "But let us not forget," she said in a statement, "that behind every clandestine center there were the names of the repressors. ... So it is very important for all citizens to know those names." The detention center was among those used in Argentina during the country's "Dirty War," which started in 1976 when a group of generals staged a coup and started a vicious crackdown against anyone considered a subversive. By the time civilian control of the government resumed in 1983, up to 30,000 Argentines had been abducted and taken to the secret government detention centers, where they were tortured and killed. They are widely called "los desaparecidos," or "the disappeared." Thousands more people were abducted and killed by right-wing dictatorships in other South American countries during the 1970s and 1980s, particularly in Chile and Uruguay. 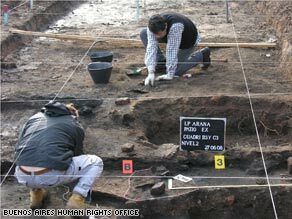 The bone fragments in Argentina were unearthed during a seven-month search at the former detention post in the city of La Plata, near Buenos Aires. In 25 years of searching, this was the first time that human remains were found at a former detention center, said Luis Fondebrider, president of the EAAF. "We've worked throughout the country and have always found remains in cemeteries, never outside," Fondebrider said in the release. The conference was called, he said, because of the extraordinary nature of the find. "We usually don't hold press conferences about our work or what we find," Fondebrider said. "But we understand that the magnitude of what we have found where the Clandestine Center of Arana was located merits that sometimes we show partial results." The searchers determined that bodies had been burned inside graves along with tires, combustibles and other material, Fondebrider said. "The possibilities of identifying some of these remains is low because of the state they are in," Fondebrider said. The searchers will start analyzing the remains next year and are working with two prominent forensic genetic laboratories that specialize in working with remains that are in poor condition, he said. Lending an official air to Tuesday's proceedings, Carlos Stornelli, minister of security for the province of Buenos Aires, and Pablo Buruera, mayor of La Plata, also attended the news conference. "We are looking for the truth so we can attain justice and construct, from there, the memory of our 30,000 'desaparecidos,' " Derotier said.